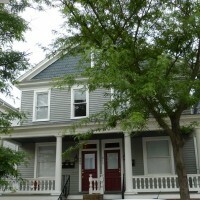 409-411 Dinwiddie Street is a c1910 Victorian house with a wide front porch, located in the Old Towne Portsmouth Historic District. The home was originally built as a townhouse style duplex, but became a fourplex post-1950s. The current owner bought it while renovations were in medias res and completed the project in a manner respectful of the building’s architectural history. 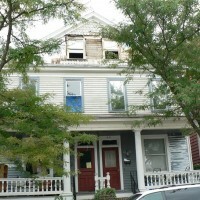 The wood clapboard siding was retained, as was the historic metal roof overtop of the front porch. A previous owner had inserted two modern windows underneath the roof gable at the third floor; the current owner removed these and inserted a single window to replicate the building’s historic appearance. All historic woodwork throughout the home was retained. As the owner of 409-411 Dinwiddie Street was unaware of the tax credit program at the outset of the project, CPG filed a retroactive application for state and federal tax credits.